BJ Sams played collegiately at McNeese State, where in 2003 he caught 63 balls for 889 yards and 7 touchdowns, while rushing for 299 yards on 38 attempts. 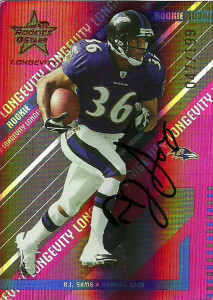 He signed with the Baltimore Ravens in 2004, where he’d do all his damage in the return game as a dangerous speedster. BJ led the NFL in punt returns (55), punt return yardage (575), and TDs (2) in 2004. On kick returns he’d have 59 returns for 1251 yards. 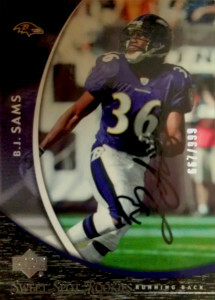 The Ravens saw fit to give him the designation of a runningback, and Sams would run 4 times for 19 yards and a TD. In each of his subsequent seasons, his numbers dropped nearly across the board and during the 2007 season while playing against the Bengals, BJ tore his anterior cruciate ligament- ending his season. Due to the timing of the injury, his size, being used primarily as a return man, and his decreasing numbers in the return game, the Ravens saw BJ as expendable. He signed with the Chiefs in 2008 playing for the franchise for 3 games. BJ moved on and signed with Dennis Green’s California Redwoods of the UFL in 2009 as a wide receiver. The team utilized him in the return game, where he led the league with 350 kick return yards on 22 attempts. Despite the presence of cannon armed quarterback Shane Boyd, Sams was rarely utilized in the passing game. He’d not be retained by the team after the season effectively ending his playing days. Lance really came to the rescue on this one. He told me that BJ had retired to the area and was coaching the local High School team, so I made a deal with Lance to send him a few cards to get signed for he and I. I immediately fell in love with the Leaf Rookies and Stars 2004 Ruby Red Longevity card, so that was a given. What does ‘future considerations’ mean. I think much like the pros it means that if I stumble onto anything that he needs that I can get, I might be able to return the favor. While I am aware that I he’s already returning a favor I bestowed upon him, I am one who prefers to keep the party exchange going as long as I can with the least amount of strings attached.